What are the requirements as defined by 35 USC § 112? So what do you, as an inventor or small businessperson, need to understand about patent enablement. In my view you just need to understand the premise behind it and to question your patent prosecutor about whether the written description he is writing for you is enabling. When an examiner is reading an application for patent enablement he/she is looking at both the claims and the written description. Note that the phrase says "a written description of the invention", and remember the invention is what is articulated in the claims, not the written description. So the analysis of the examiner is to the question of whether a particular claim is supported by the written description in an application requires a determination of whether that written description, when filed, contained sufficient information regarding the subject matter of the claims to enable someone skilled in the pertinent art to make and use the claimed invention. As in many other patent statues, the eventual interpretation of the real meaning occurred later in case law. In the Supreme Court decision of Mineral Separation v. Hyde, 242 U.S. 261, 270 (1916) - the question was asked "is the experimentation needed to practice the invention undue or unreasonable?. That standard has been advocated in the us patent office ever since. Note that this language of "undue or unreasonable experimentation" does not appear in the statue above. But it has now been interpreted to require that the claimed invention be enabled so that any person skilled in the art can make and use the invention without undue experimentation. This is what we have meant in these articles when we say that statue interpretation more often comes from case law than the original statue. (H) The quantity of experimentation needed to make or use the invention based on the content of the disclosure. The examiner is also taught that it is improper to conclude that a disclosure is not enabling based on an analysis of only one of the above factors while ignoring one or more of the others. The examiner's analysis must consider all the evidence related to each of these factors, and any conclusion of nonenablement must be based on the evidence as a whole. Another thing you need to be aware of is that despite element (G) above, patent enablement does not turn on whether an example is disclosed. An example may be "working" or "prophetic." A working example is based on work actually performed. A prophetic example describes an embodiment of the invention based on predicted results rather than work actually conducted or results actually achieved. So where does all of this leave us? As you can probably see, patent enablement can be rather subjective. And people have lost patents over enablement issues. To date though I have not had enablement issues with the US patent office. My approach, when I am drafting an application, particularly when writing the detailed description, is that I go into a teaching frame of mind. How can I teach the examiner how this thing works? And while writing the detailed description I keep a copy of my main claims on another screen. This is to ensure I am not only teaching but teaching all of the steps of the independent claims. If it is a well known field, and one in which the results are predictable I do not have to teach as much. If it is a field in which major new ground is being broken I often feel that I have to teach much more - i.e., in more detail. 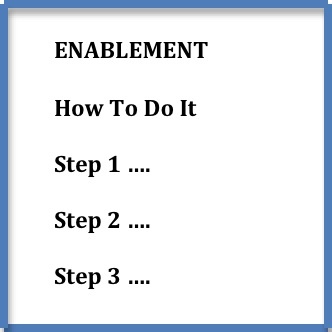 The part of the steps for getting a patent in which patent enablement often raises its head is usually in the first office action or sometimes after claim amendment in the second office action. The possible responses can take several forms, about which I may write later. Briefly, the applicant may simply make an argument that the examiner failed to make a convincing case for lack of enablement, may submit factual affidavits from experts showing why the written description is enabling, or may just delve much deeper into a teaching mode to convince the examiner that the enablement is present. It simply depends on the circumstances. More on that later. But our next step along the specification path will be to examine the best mode requirement.